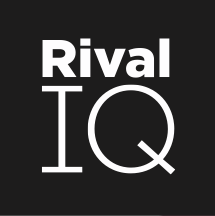 In this article, we'll go over everything you'll see in the Posts tab of the Instagram Insights section of Rival IQ. All posts published after your account became an Instagram Business Account will appear here. This is because Instagram doesn't track and report insights on posts prior to this. 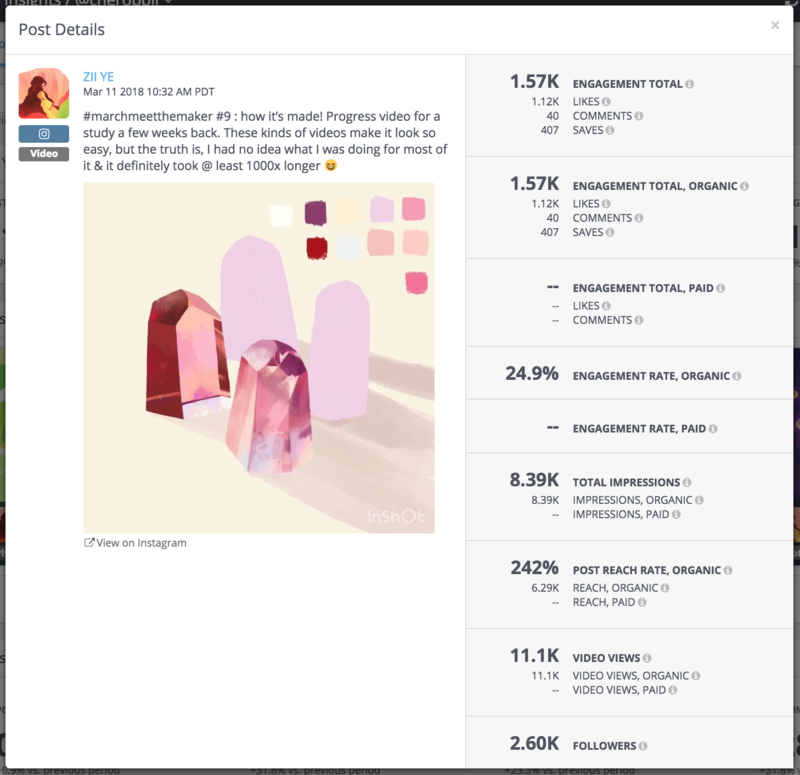 There are a couple things you should set up before you start analyzing your Instagram Insights. First, if you promote Instagram posts, make sure the Facebook Ads Account you use is connected to Rival IQ. This will ensure that we're reporting on both organic + paid reach and engagement. Without your Facebook Ads Account, we can only access organic metrics. Second, use the timezone picker to align your post times. Note that this timezone only applies to Instagram Insights, and not social posts (which reports published times in UTC). 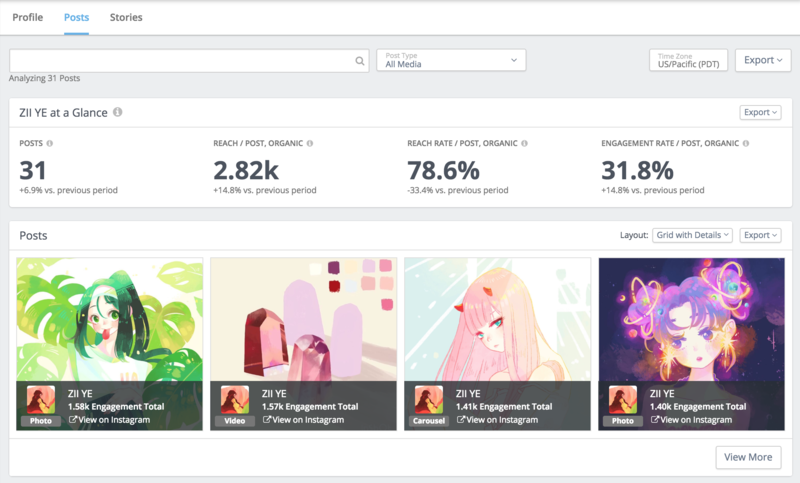 The At a Glance panel displays your posting activity, organic reach, and organic engagement activity during the selected time period. In this example, 31 posts were published during this time period, and each post was seen organically by an average of 2.82k unique accounts. Reach Rate is the reach divided by the number of followers at the time of posting. Engagement Rate is the engagement total (likes, comments, saves) divided by the number of unique accounts that saw the post. The Posts panel displays the posts published during the time period, sorted by engagement total. 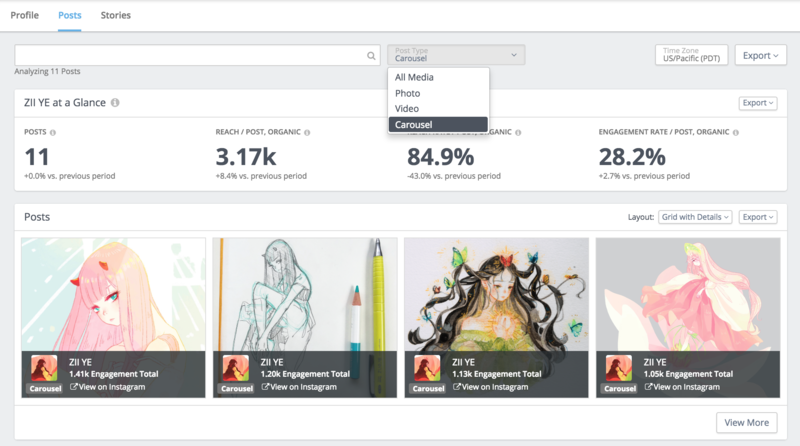 Click "View More" on the Posts panel to analyze more posts, columns, and sorts. Click on a post to view more information about it. Below, is a video post that includes Video Views, which are the number of impressions that watched at least 3 seconds of this video. In this case, the video was replayed multiple times since there are more video views than impressions. Notice that the paid metrics are labeled with --? This means that this post was not promoted. Promoted posts are adorned with an orange box with the promoted amount. When you click on it, you will see the breakdown of organic vs paid metrics. 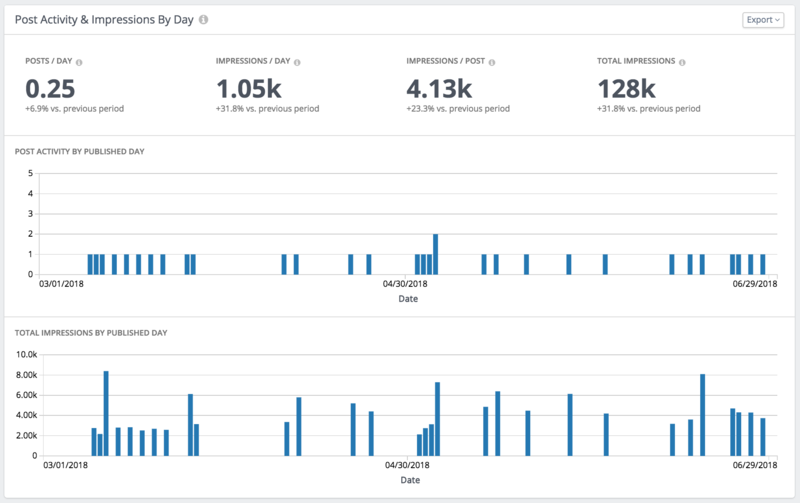 The Post Activity & Impressions By Day panel allows you to compare your post activity trends with the total impressions you receive each day. Use this to analyze your post activity and compare any spikes or decreases in impressions on a particular day. The Hashtags panel summarizes the most commonly used hashtags in your posts. Using this, you can decipher the hashtags that generate higher reach or engagement rate per post. Hover each row to enable the eye and magnifying glass icons to quickly view some of these posts or filter the dashboard with them. Use the "View More" button to view more metric in this panel. The Post Type panel summarizes the post types you most frequently post, and the reach and engagement you receive from posting each type. Use the View More to add more metric columns. When we find interesting insights. you'll seem them on the right side of the panel. The Post Time panel compares your post times to when reach was received. 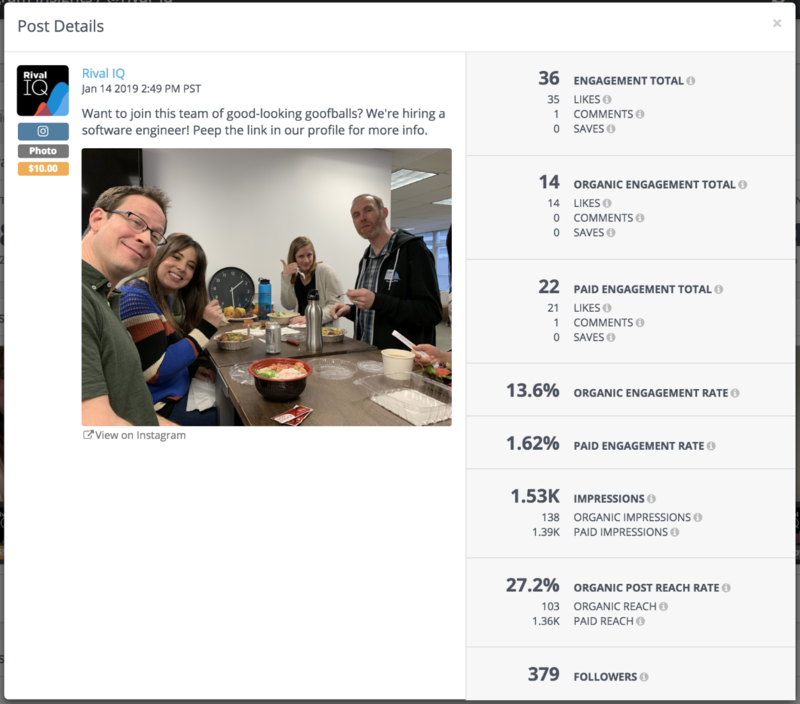 Note that this is different from the panel in Social Posts that compares post time to engagement rate. You can also search and filter your posts using the search bar and post type drop down at the top.